Today was the sort of day that makes you love living in Austin. The day was gorgeous, sunny, clear and warm -- the thermometer in Doug's parents' truck said it was in the 80s. A stark contrast from yesterday's drizzle and a nice reprieve for Doug's parents from a Midwestern winter. Like yesterday, Doug and I were on a mission to introduce his parents to different aspects of Austin. We started the day at one of our favorite places for brunch -- Moonshine Patio. With the nice weather we were able to sit outside. Doug's mom had a mimosa while the rest of us had a poinsettia, or champagne and cranberry juice. After brunch we drove to Wimberley, a little town southwest of Austin. Wimberley has the feel of an artists' community and you can spend hours looking through the little shops. Doug and I got turned on to an Austin artist, Manuel Garza. He has such great details in his paintings. One neat thing, he paints a cardinal in each of his paintings and his signature includes a butterfly. We only got to spend an hour in Wimberley as we had tickets to an afternoon play at the Zachary Scott Theatre. The play was Urinetown and it was easy to see why it won three Tony awards in 2002. Although the title of the musical is a bit unseemly, the play is hilariously funny and is a satire of some of the great Broadway shows. The show actually mocks itself with Little Sally adamant that no one is going to go see a show with the title Urinetown. The play tells the story of what happens when we don't manage our natural resources and face a drought (very appropriate right now in Texas). But in the telling of the story, you are not sure if you are watching Urinetown or another show. For example, Act 2 starts out with a scene reminiscent of Fiddler on the Roof. You also see glimpses of Annie, Big River and West Side Story. And just so you won't get confused with what is supposed to happen when in a play, Officer Lockstock takes the time to explain to Little Sally how musicals are set up ("I can't just tell you about Urinetown, it has to unfold" or "this is the finale of the first act, which means it's a big number with all the cast members"). Because we volunteer at the Zach, Doug and I see a lot of shows there. This really has to be the best one in awhile and we are looking forward to working it and seeing it again. By the time the show was over, it was 5 o'clock. Doug's parents were a bit tired. They are leaving tomorrow and want to pack, so we called it a day. However, they did say that they really enjoyed their weekend and were able to discover a lot of new Austin places to add to their list. They are already plotting their next trip to Austin. Whenever there is a first time visitor to Austin, it's pretty obvious where to take them -- the standard sights to see. But what does one do with visitors who have been here several times over the past half dozen years? Such is the quandary we face with the visit of Doug's parents this weekend, who came down to see him and escape the northern Missouri winter. 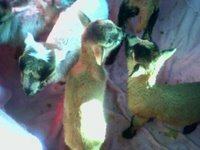 They arrived Thursday night. Since it was Thursday, it was brew night and they got to experience Doug and Robert brewing beer. They have been to Austin enough that they went to some of the their favorite places (like Book People) on Friday while we were at work, and on Friday night we took his folks out to dinner and to catch the Austin Wranglers. But what to do for Saturday, something his folks hadn't done before? We decided to start the day with breakfast at Maria's Taco Xpress on South Lamar. We really didn't want a heavy breakfast, so we figured breakfast tacos would hit the spot. I'm almost embarrassed to admit that in the six years Doug and I have lived here, we haven't once frequented this Austin landmark. After all, we live in the northern suburbs and that's quite a drive just to get breakfast tacos. Let's face it, there is basically a place on every corner in town to get breakfast tacos, so why drive? But this restaurant was featured on Rachel Ray's $40 a Day and we thought his parents would get a kick out of it. Ends up that the drive was well worth it -- the migas breakfast tacos were outstanding. Doug said that if Maria ever opened up north, he would be there every weekend. Alas, the funkiness of the place can only exist in South Austin. We had planned to go to the Sunset Valley Farmer's Market after breakfast, but the much-needed rain put a crimp in those plans. Instead we headed out towards Johnson City and visited one of our favorite Texas wineries, Texas Hills Vineyard. I think they have one of the pretties tasting rooms around. We sampled a variety of wines and Jim & Barb and Doug & I both bought a couple of bottles. Leaving Texas Hills, we continued north on Hwy. 281 to Hwy. 29. We decided we would take Doug's parents to the see the eagles. While they said that they have eagles in Missouri, once we got to the nest, they were impressed. We were able to spot all three adults. We still haven't seen the eaglets, but maybe that is an excuse for Doug and I to make another trip in a few weeks. 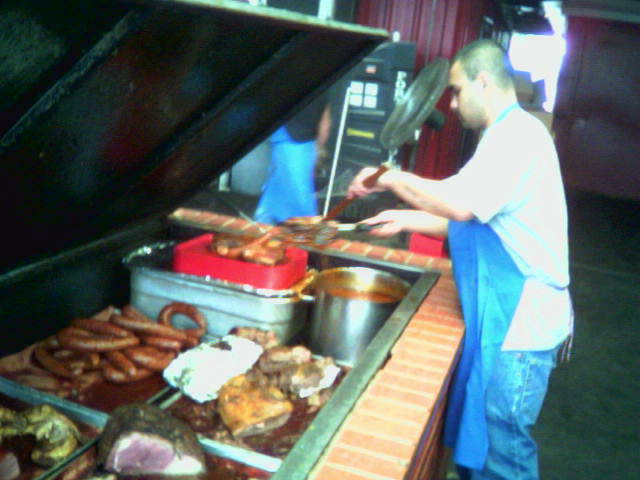 Since it was lunchtime, we headed on in to Llano and to Coopers barbecue. This was the first time we've been there that there wasn't a line around the building. I guess the rain kept the bikers away. Doug's parents were very impressed with Coopers, but like our last visit, Doug and I weren't "wowed." Doug's parents were getting a bit tired, so we headed home, taking the scenic route of FM 1431 past Inks Lake and Lake LBJ. Doug and I still say we can see his parents becoming snowbirds and getting a place on the Highland Lakes so his dad could spend all winter fishing. We let his folks rest up for a few hours and then took them to an Austin Ice Bats hockey game. The minor league team was playing the Oklahoma City Blazers. What was interesting is that they were calling it the "Red River Shoot Out" and the Bats were wearing Longhorn jerseys and OKC was wearing OU jerseys. 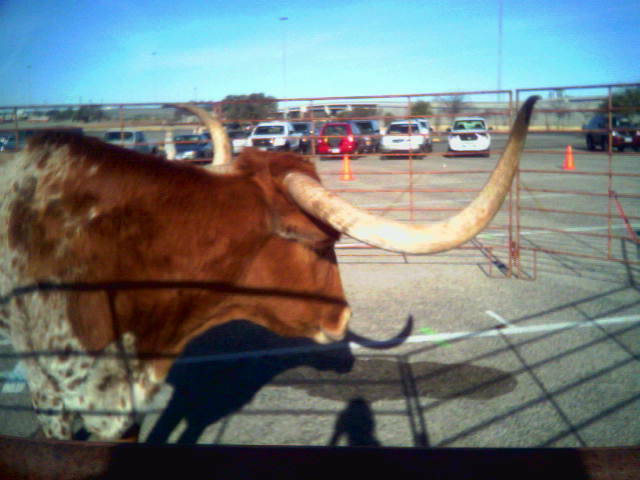 It actually was a bit confusing as I wanted to yell out "Go Horns!" instead of "Go Bats!" The game was pretty exciting and we had fun. There were a couple of fights, with one of the OKC players clocking one of the Bats in the face with his stick. The game ended in a tie. When this happens in minor league hockey, it goes into a five minute overtime period. This too ended in a tie. Next step -- a shoot off. This is where five players from each team get to shoot for a goal. At this point, it's only the player against the goalie. The team that shoots the most goals wins the game. The tension builds with every shot, but the Ice Bats pulled it through to win the game. Today we have another full day planned, complete with brunch at one of our favorite places and a play at the Zach Scott. The travelogue will continue later. Tonight we went to the Austin Ice Bats minor league hockey game. 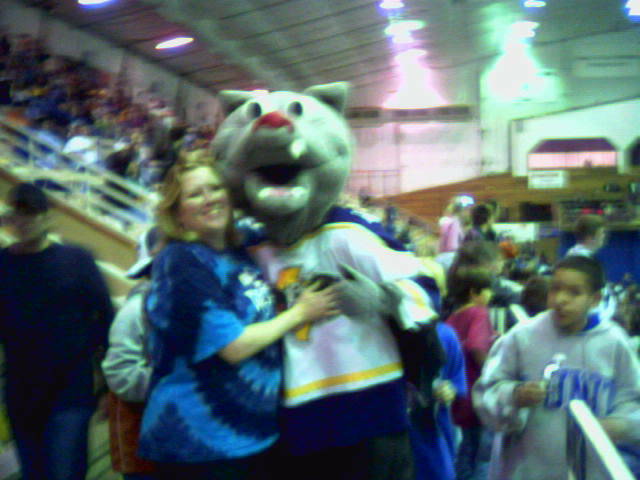 Here I am with Fang, the team mascot. It was a very exciting game. The game went into overtime and the Ice Bats won in a shoot out. Doug's parents are visiting this weekend. Tonight we had dinner at Threadgill's, an Austin landmark. We went to the north location and Jim got a kick out of eating at one of Janis Joplin's old hang outs. 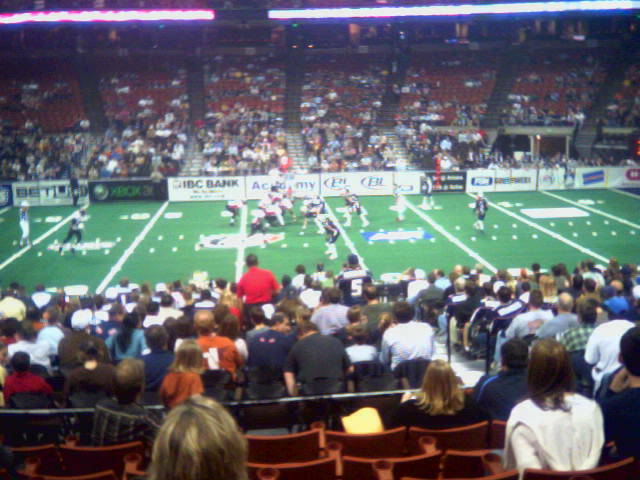 Tonight we attended the season opener of the Austin Wranglers, the local arena football team. They played Las Vegas. Besides being indoors, the field is half the size and there are only 8 players on the field. The game is much faster and the scores are a lot higher -- tonight's score was 64 to 46, Wranglers. Go Wranglers! These games are a lot of fun, it's almost a cross between football and hockey. Like hockey, the players are slammed against the boards on the sidelines. Also like hockey, there is a lot of fun and games and audience interaction -- sumo wrestling, races, fun-loving mascots and folks throwing t-shirts to audience members. The game isn't taken too seriously. After the game, we stopped at Amy's Ice Cream on Guadalupe. It was a sweet way to end the evening. Doug started a new contract yesterday. It's a three month contract with G-Tech, a company that develops lottery software. The headquarters is in Rhode Island, but has a big development operation here in Austin. Doug will be traveling some and already has his first trip to Rhode Island scheduled. I thought I would do something nice for him for dinner, so I decided I would make one of his favorite dishes -- fried pork tenderloin. Actually his favorite dish is a tenderloin sandwich from Hy-Vee, a grocery store in his hometown of Chillicothe, MO. Now I've never thought a deli grill at a grocery store is gourmet dining, but evidently this sandwich is nirvana and all the people who have moved away make sure they pray at the alter of the tenderloin sandwich whenever they visit Chillicothe. I didn't actually make the sandwich (that's leftovers tonight), I simply made the tenderloin. Being from the south, you would expect that I love breaded and fried meats and vegetables, but really, I don't like them that much and I don't like the mess and smell of frying food, so I have never tried to make friend tenderloin before. Plus, I figure if you have a nice cut of meat like a tenderloin, you do best to roast it with rosemary and garlic; frying it with breadcumbs is almost sacrilege. At the very least, taking a 4-inch round tenderloin and pounding the crap out of it until it is a 1/4-inch flat piece of meat takes more time and effort than I usually want to expend. My shoulder is still sore this morning. Still, Doug appreciated it, and we have enough leftovers that he can have a tenderloin sandwich tonight. I did ask him how it compared to Hy-Vee and while he liked what I did, my tenderloin cannot hold a candle to Hy-Vee. I guess he'll have to go visit Chillicothe soon. Winter has finally arrived in central Texas. For most of January the high temperatures have been in the 60s and 70s and while it gets down to the 40s at night, we haven't had to run our heater. That is, until yesterday. Yesterday the highs were in the 40s and it was sort of rainy. Right now we are going through a drought so we welcome precipitation but yesterday it was toying with us. It was misting and dark, but there wasn't enough rain to do more than just frizz your hair. With the weather being so yucky, we decided it was perfect chili weather. I was really hankering for a pork chili verde, so that's what we did. I took some of our frozen Hatch chiles and mixed a bag of mild chiles with a few hot chiles. I also added tomatillos, onion, shallots and garlic. I cubed and browned a pork loin and added that to the chiles, added chicken broth and some of Doug's homemade Mexican Pilsner Pepper beer. 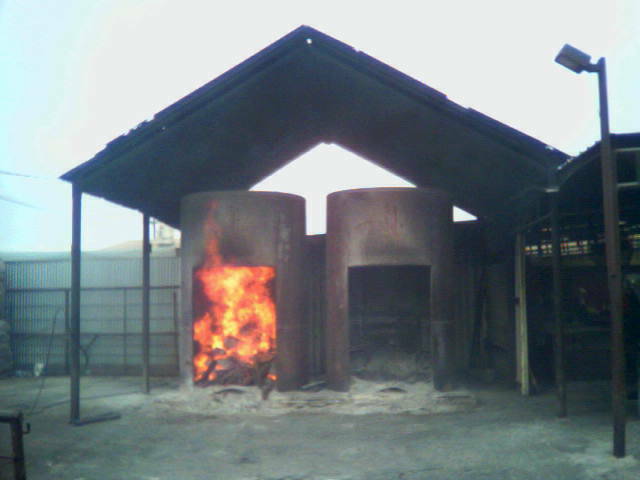 I let everything cook together for 2-3 hours, until most of the liquid had cooked off. I served it over rice, with Monterrey Jack cheese. Yummy. The first bite was mild, like most chili verde, but the after taste was spicy. It was pretty yummy and just perfect for the weather. I do hope this cold snap doesn't last too long, though. Sorry for the limited postings this week. School started Tuesday and there is all the stuff one has to get done at the beginning of the semester. I am teaching two sections of Intro to Public Relations. The classes are MWF at 8 and 10 a.m. Ouch! That means I should leave the house by 6:15 to make sure I get there plenty of time and print out anything I need. Actually, I don't mind those classes as much as I mind the thought of those classes. Traffic, while more than you might think at 6:30, moves rather quickly. Yesterday it took me 47 minutes from my driveway to the parking lot. A lot better than the 2 hours it took me to get home one night last semester. And because I arrive on campus before 7:30, I can actually park in the nearby parking lot and walk to my building. Granted, the lot is at the bottom of a steep hill, but it beats parking at the stadium and taking the bus. The 8 a.m. class has about 50 students in it and they are more alert and want to participate in discussion more than you might think. The 10 a.m. class has close to 75 students and they are pretty quiet. There was still a lot of schedule changes last week, but my roster should be close to final by Monday. As for the classes I'm taking, this is the semester to write my thesis. Most of the research is done. The other class I'm taking is an intensive three weekend (Friday night, Saturday all day) creativity class. It doesn't start for two weeks, but our team has already met, trying to formulate our game plan. I have paper due the first night in that class. In fact, I need to go so I can get started on it. Here in Austin we all are still celebrating the Longhorns winning the NCAA 2005 National Football Championship. Not to take anything away from that, but another local university recently won a different college championship. Just this week the Texas University Bobcats won the 2006 College Cheerleading and Dance Team Championship. It was the all-girl squad and was their third time to win the competition. The co-ed squad also did well, reaching the finals and placing eighth. Granted, UT is a Tier 1 university and is one of the largest, most prestigious schools in the nation, but sometimes it feels like the accomplishments of the other local universities (there are at least five, not count community colleges, within 30 minutes of UT) are overshadowed by UT. Shouldn't we get some recognition too? Last semester I was talking to someone who said that their little sister had transferred from Texas State to UT because of the strength of UT's advertising program. This person didn't realize that Texas State consistently wins the state American Advertising Federation student advertising competition (usually the biggest competition comes from SMU, not UT) and does well in the national competition. In fact, this summer the team won the national championship for the second time. As for the Texas State football team, the conference it plays in actually has playoffs, and not bowl games. This fall the team made it all the way to the national semifinals before being beat. Since this happened during the lull of the UT season, we did get a bit of coverage on this, but the high school playoffs received more. 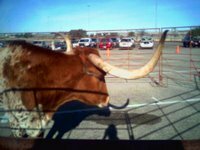 I'm sure this is not unique to Texas State -- I bet the other local colleges also sometimes feel like the redhead step-child compared to UT. I'm not saying that UT is unimportant, I would just like to see more press coverage regarding the other schools. The news doesn't have to be all UT. After all, isn't winning a national advertising championship just as newsworthy as losing the bid to run Los Alamos? This morning I was driving to the downtown office where I have been freelancing over break. I am punching the dial on the radio, trying to see what Austin channel can hold my attention for more than a minute. I notice one station is doing the news, so I pause for a minute. They are airing the syndicated news from Fox News. The obligatory MLK stories air and there is one about Bush visiting the National Archives to examine the original copy of the Emancipation Proclamation. The "journalist" (and I use this term lightly) said that this was the document that led to the Civil War. For those of you who do not know, the Emancipation Proclamation was issued September, 1862 and went into effect January, 1863. The first battle of Civil War occurred in April, 1861 -- a full 17 months before the Emancipation Proclamation. Fox News claims to be fair and balanced, but I guess there is a reason the don't claim to be accurate. Although that was the end of the national news, that wasn't the end of the inaccuracies. This time it was a local reporter, talking about what MLK activities were going on today in Austin. "If he were alive today, it would be Dr. King's 77th birthday." That's interesting -- Dr. King's birthday just always falls on a Monday. Actually, that's not true. It is always observed on a Monday so we can have a three-day weekend. Dr. King's birthday is actually Jan. 15. I haven't decided whether I think these mistakes are more funny or more sad. No wonder Americans don't know their history -- their information sources are full of glaring errors. Given that this was the last weekend before school starts, Doug and I were itching to do a day trip today. 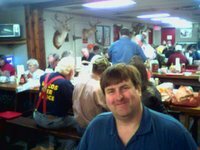 When we woke up, we decided that we would continue the barbecue quest we started a few weeks ago and head up to Cooper's in Llano. Our plan was to spend the day traversing the Highland Lakes area and see where we ended up. We loaded up the car with the dogs, maps and guidebooks and headed out. We took Hwy. 29 from Georgetown and our first stop was to see the eagles' nest between Buchanan Dam and Llano. The area around Lake Buchanan is the winter home to some American Bald Eagles. The eagles, which are on the endangered species list, tend to return every year to the same nest. About three years ago a trio of eagles built a nest in a dead tree about a hundred yards off Hwy. 29. This has become quite the attraction with people coming from different parts of the state to see the birds. The Texas Game & Wildlife says this particular nest is the furthest west an eagle's nest has been built in Texas. 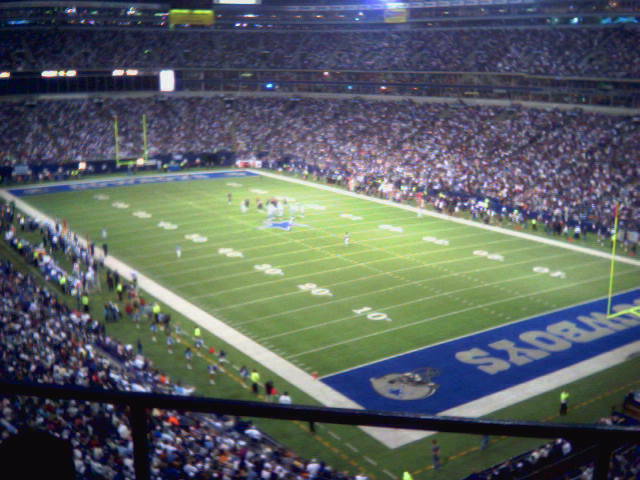 Because I lost my digital camera at the Cowboys game a couple of weeks ago, I couldn't get any good photos (camera phones don't do justice). You can, however, find some great photos on this site. While we were there, we were able to see two adults at the nest. One gentleman who is out there several days a week shooting photos said that the eaglettes have hatched, and we should be able to see them in a few weeks. After the male flew off, Doug and I headed on our way to Coopers. On the way, we passed a lady with a flat tire, so karma demanded that we turn around and help. I'm glad we did. A truck had stopped, but he didn't have the tools Doug did. The spare was bolted in the trunk and the tire was shredded and had wrapped around the brake line. The lady was on the way to the hospital, where her granddaughter had been taken to the emergency room. Doug was able to get the lady back on the road in no time. About 11:30 we arrived at Coopers. 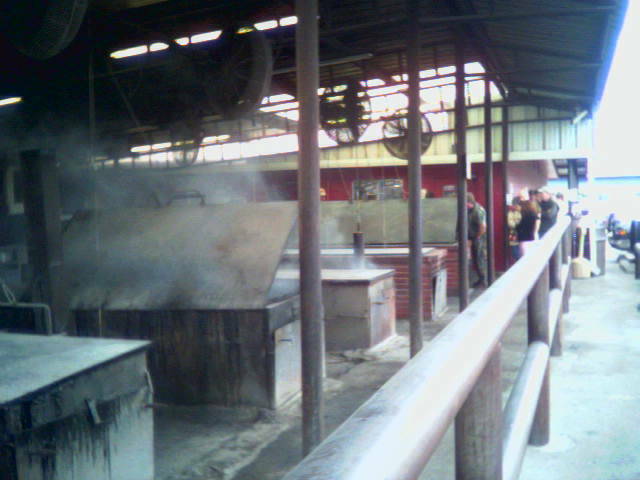 The thing about this place is that you go up to the pit and select your own meat. When we arrived, there were about 30 people in line. Once you get your food, you go inside to pay and eat. There are six long picnic tables inside and you just pick a spot and eat, usually sitting next to a stranger. 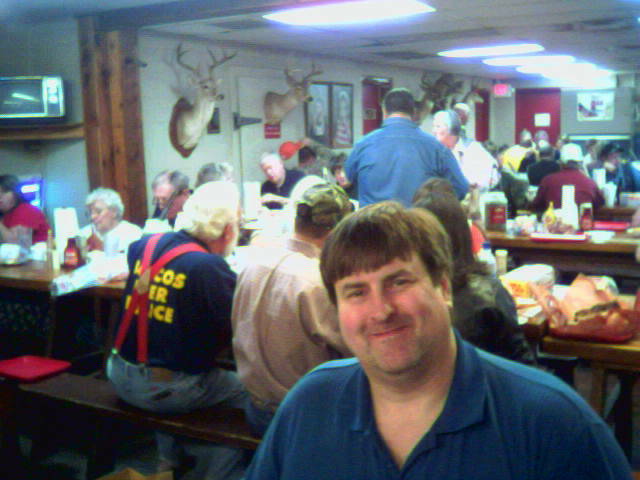 The inside was packed, and that wasn't even counting all the folks who were getting to go orders. Coopers is definitely popular, especially with the hunters and motorcycle riders, both of whom were out in force today. Today we had some of the best pork ribs I have ever had. However, our other meat didn't live up to our previous experience with Coopers. Both the sausage and the prime rib were luke warm at best, and I swear at least 1/2 pound of the prime rib was a hunk of fat -- and you pay by the pound. Oh well, the dogs got to eat some expensive table scrapes. Still, we do enjoy Coopers and will go back. Photos from Coopers are below. You first see the smoker and then the next photo is the rows of barbecue pits. 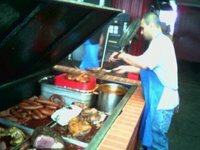 You can see the guy getting our food off the pit, and Doug enjoying his lunch. After leaving Coopers, we decided to head a bit north and visit a couple of wineries we had never been to. These wineries are in a dry county and until a few years ago, could not have a tasting room. During the Wine Trail weekends, these wineries would hold tastings in a bed and breakfast near Stonewall. Now the law has changed and it was our first time to go visit. We first stopped at Alamosa Wine Cellars, but if they had a tasting room, it didn't look open, so we didn't stop. We decided to head on to Lampasas and Pillar Bluff Vineyards. We got to sit and chat awhile, and of course, sample seven wines. 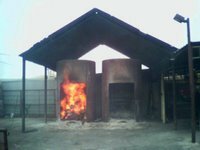 We opted to purchase a bottle of their Muscat and a bottle of their White Merlot, both that will be good hot-weather wines. After that, we decided to head home. As always, we enjoyed our trip exploring the hill country. Eagles, barbecue and wine -- what more could one want in a weekend? Take this Nerd Test and post your results in the comments (you don't have to register to post a comment -- simply click "Other" or "Anonymous" and you can post a reply). I scored a 15. According to the results, this means I'm not nerdy, but then again maybe not all that cool either. Ha! This morning I was in the mood to have breakfast at the Sunset Valley Farmer's Market. This south Austin farmer's market is truly an Austin original. While most farmer's markets are filled to the bins with fresh fruits and vegetables, in this market you have to search to find the fresh tomatoes. Yes, there are vegetables, organic of course, but the stalls are more likely to be filled with jellies, sweets, spices, jewelry, soy candles, lavender patchouli soap and dog biscuits. 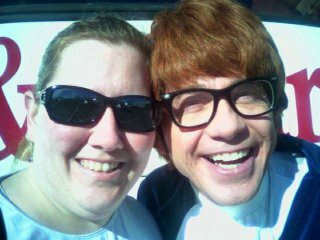 You never know what you'll see at the farmer's market -- today Austin Powers was on hand. Being Austin, there was a band playing and one stall was doing a dance demonstration. Local writer Jim Hightower was doing a book signing. While there we picked up some treats for the dogs and grabbed a couple of pesto foccacia rolls from Living Arts Bakery, which was our reason for heading to the market in the first place. There was both Greek and Turkish food to go, fresh cheeses and instead of peanut butter, we sampled pecan butter -- it was REALLY good. We sampled a chocolate brownie made with rose -- quite interesting. Doug talked to one guy who was selling nectar, thinking he might be able to utilize the nectar in either a batch of mead or beer, but since that vendor is there every week, Doug decided to hold off. While there were interesting things at most of the stalls, in the end the only thing we bought, other than breakfast, were some dog treats. Of course, being a farmer's market, there were some farm animals. We got see some baby sheep and a longhorn, but we couldn't take either home. The only thing that would make going to the market better is if it wasn't so far away from where we live. Unfortunately the farmer's markets closer to our house tend to specialize in produce only. I am a movie buff. I like watching good movies and can watch the same movie 50 times. This goes back to being a little girl and watching movies like Giant or An Imitation of Life with my mom. I can tell you everything about the movie, the stars and the stories behind my favorite movies. The DVD director commentaries were developed for people like me. Then I met Doug, who made me look like a movie novice. When I met Doug, he basically would watch any movie that came out. He's getting better, but like today, he watched Harold & Kumar Go To Whitecastle on television and is looking forward to the sequel. Still, we are a good match when it comes to movies. But over the past year we are attending movies less. One major reason is our schedule. It was very difficult for us this fall to have 2-3 hours to catch a weekend matinee. The second reason was just the quality of movies. For most of the fall, there were no great reasons to make time to go see a movie; the so-so movies are ending up on cable soon enough. However, there is a third reason, and it's the one that generally ruins the movie for us -- our viewer experience. It is getting really bad lately here in Austin. I'm not just talking about customer service -- that's mediocre enough. And some of that customer service is just bush-league stuff. For example, while we don't do Internet tickets, often we purchase our tickets from the kiosk inside the Cinemark theatre. There are no lines and I like to play with the touch screen. But a few weeks ago we were standing behind a guy at the kiosk and I noticed something -- the screen software has changed and the credit card number, in full, and the card expiration date, now appears on the screen. I could have taken a photo of that with my camera phone and made my Christmas purchases using this guy's card. Needless to say, we have started once again to stand in line at the outside box office to get our tickets. The thing that really ruins my movie experience, however, is the dreaded movie talker. Since when is it okay to talk throughout the movie? Please tell me, as I missed the memo. Is this a new Austin trend that I am missing out on? At home, if we need to talk or want to make a comment, we hit pause, have our say, then return to the show without missing a word of dialogue (the wonders of digital satellite). I wish I could do the same thing when someone starts talking in the theatre. Today we went to see Memoirs of a Geisha. School doesn't start until next week and Doug has a couple of weeks until his next contract starts, so what better time to catch up on movies than Tuesday afternoon. Unfortunately several Chatty Cathys thought the same thing. We had two senior women who sat a few seats down from us and they didn't know what a whisper was and decided they needed to narrate the story. I tried my death-ray stare several times, but they were so enthralled with themselves that they didn't notice. After about 15 minutes of this, I got up and moved two rows back. Doug sat there for a minute, looked backed at me and decided to do the same. That wasn't the end of it, though. I could still hear the ladies two rows up and now, behind us, we had some other ladies behind us who were whisperers. At least they knew what a quiet voice was. Still, it was annoying. This is not a one-time thing. Last week we saw Casanova. Again, only a few folks in the theatre, but a couple in their 50s were in the row behind us and a few seats over. While the wife seemed to realize they were being annoying, the husband could not keep from asking questions and providing commentary and again, did not use his quiet voice. The death-ray stare seemed to get the attention of the wife, but she could not stop the husband. Finally, after about 90 minutes of this, Doug turned and said rather loudly, "sir, we do not need your commentary." The husband responded, "thank you," and then kept quiet for the remaining 15 minutes of the film. At least Doug didn't have to resort to standing up in front of the guy, blocking the view, although he has successfully utilized that tactic a time or two. Two weeks ago we went to see King Kong. The movie had been open about a month but the theatre was still a bit crowded. Again, behind us and to the side sat the movie talkers. Now one talker, I had some sympathy for -- the gentleman was in his early 20s and was slightly developmentally disabled. I could forgive him, as I realized how thrilled he was with the movie. However, I could not forgive the person who was with him -- maybe it was his mom. Not only did she not make an attempt to let him know that talking was inappropriate, she would respond to his questions in a normal tone of voice. The death-ray stare worked at first to get her to lower a voice to a whisper, but the stare lost all effectiveness when they decided that the theatre was their living room and as such, put their feet on the back of the chairs in front of them (which were next to me). As I turned to give the stare, all I could see were shoes. I don't know about you, but my momma taught me something about not having shoes on furniture. About the only movie we've seen in Austin this past month wasn't ruined by a talker was Brokeback Mountain. I'm not sure if that's because the audience for that movie is more sophisticated and bigger movie fans, or if just some of the scenes were shocking enough to leave some people speechless. Either way, that was the best experience we had in awhile. I'm not sure what the answer is ... maybe we do wait until the movies come out on HBO. Still part of the joy of seeing a movie is watching it on the big screen. It's just ashame that the experience is being ruined by a few thoughtless others. 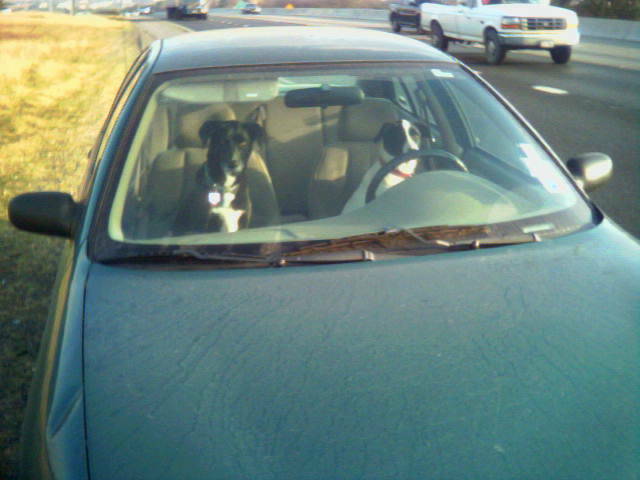 I've heard of dogs playing poker but never dogs driving cars. However, Dante and Allegra decided to take a spin this morning. I apologize for no postings this week. Last weekend we traveled to Dallas to celebrate the new year with my family. My parents were in town visiting my sister Chris. We had Christmas with the girls. Doug and I bought them a game table, where they can play fusbol, ping pong, shuffle board and pool. The girls seemed to really like it and when Kelsey got back from a New Year Eve's party, she started putting it together. I think mom also liked her gifts. For New Year's Eve, we just hung out at my sister's house. Chris & Mark, mom & Lauren, and Doug & I played Cranium. It was fun, especially when Lauren kept picking categories where she would have to act, sing or perform, and she would proceed to ask, "will I know this?" I really just prefer a low key New Years. We either stay home and do something like have a dinner and movie night (like cooking my special pasta bolognese and watching The Godfather) or we have a few friends over or go over to a friend's house. I have never understood going out to some place that is incredibly packed to pay a premium. I would rather go to that same place a week later when it's not so crowded or expensive. I'm the same with Valentine's Day. 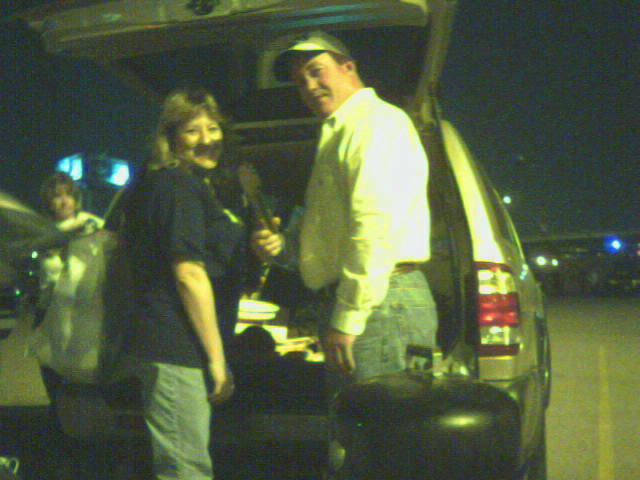 For New Years day, my other sister, Stacey, and her fiance flew to Dallas and we all went to the Cowboys game. The game was okay -- it would have been more interesting if the Redskins hadn't won earlier that day. Unfortunately I left my camera at the stadium and no one turned it in. I have my camera phone, but my Canon was pretty nice. Plus we hadn't downloaded the holiday photos. This week I have been doing work at Blanc & Otus, the PR firm I worked at this summer. I've been helping with some research, particularly blog research. I think I must have reviewed 2 million blogs this week (okay, not that much, but still enough that I don't want to come home and get online). I still have some more work to finish up for them this week. 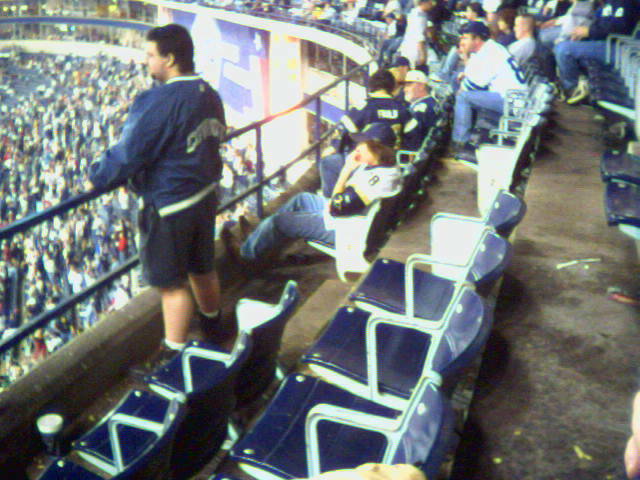 The crowd is thinning out during the fourth quarter. The Rams are ahead, the Cowboys are making stupid mistakes and the game doesn't matter. But the crowd sure cleared fast. We are at the end of the first quarter and the score is 7 to 0, Cowboys. However, even if the 'boys win, they won't be in the play offs. The Redskins spoiled it for the earlier this afternoon. We are in Dallas this weekend, celebrating the holidays with my family. Tonight we are going to the Cowboys football game with my sister and their significant others. Here we are before the game tailgating.